Aquatic therapy is a low impact style of therapy that is performed in the water, rather than on land. Aquatic therapy can be more beneficial than land-based therapy for some people. When you get in the water you decrease your ground reaction force, which is the amount of stress put through your body by the ground pushing up through your leg when you take a step. The buoyancy of the water takes compressive stresses off of our joints, which counteracts the forces of gravity and body weight. Buoyancy allows someone standing in chest deep water to weigh approximately 25% of their land-based weight. This decrease in weight and stress allows weaker muscles to activate longer without getting as tired. The aquatic therapy pool at Aspire Hospital Center for Rehab is heated to around 96 degrees. This is a great temperature to perform physical therapy in because it encourages tight muscles to relax and stiff joints to loosen up. Typically we find that arthritic joints feel better in aquatic therapy because of the temperature and the compression from the water. When we take weight off of our body and we warm our muscles up, our bodies move much more freely, we fatigue less and typically have less muscle soreness afterwards. 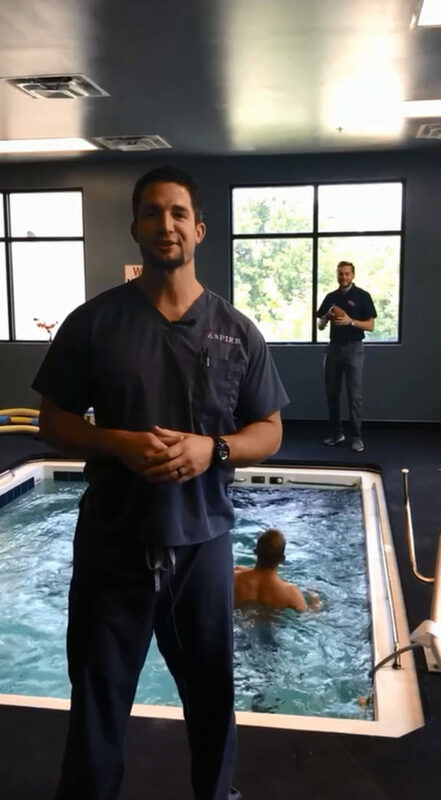 Our bodies are made to move and aquatic therapy is just one way we assist our patients in improving their movement!